Wow! Thanks for sharing this great album. 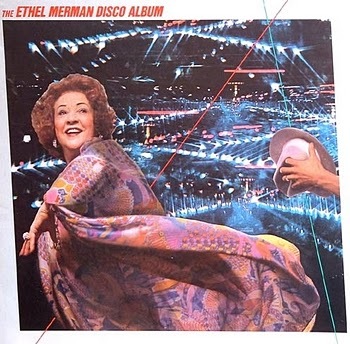 Hearing Ethel Merman sing her "signature" song, "There's no Business Like Show Business" to a disco beat is a "total trip". Sweet Baby Jesus! Oh, happy day! Finally, a long-coveted audio (oddio?) curiosity is here. Mr. Fab, have I told you how awesome I think you are, in the last 5 minutes or so..? Thanks, Mr. Fab. Happy New Year! Ha, you-all are very welcome. Dare I record Myron Floren's "Disco Polka" album now, or should I have mercy on everyone's ears? and i would have absolutely no prob with the disco polka! I second the Myron F disco polka post. Do it for the children. One of my favorite thrift store finds. Disco Ethel made her way into many a mixtape back in the day, and friends still curse me for it.